First edition of this selection (copyrighted 1977 to Frederik Pohl), apparent first printing. Translation copyrighted 1977 to Heyne. "Printed in Germany 1977" stated on copyright page. 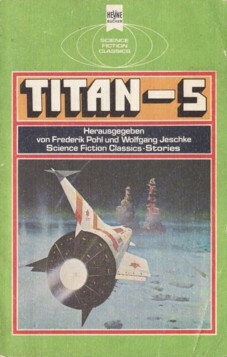 It's 'Titan-5' on the cover and the spine, but 'Titan 5' on the title page. "Angerhelm" ends on p. 157, with p. 156 being the last numbered one. Translations by Walter Brumm, Joachim Pente and Horst Pukallus. Cover artist credited on copyright page wrongly as Eddie Jones, but cover features the same art as Slan . Month from "Science Fiction Times #s 140-142".